When announcing the winner for Best Director at the sixth Academy Awards, host Will Rogers said, “Come and get it, Frank,” meaning Frank Lloyd, the director of soon-to-be Best Picture winner Cavalcade. However, some thought he meant Frank Capra, who had directed Best Picture nominee Lady for a Day. In fact, Capra himself thought this and actually stood up and began walking to the stage before realizing that he was not the correct Frank. Capra returned to his seat, later referring to the event as the “longest crawl in history.” However, the following year Capra would make a different kind of history by directing It Happened One Night, the first (of only three) films to win all five major awards: Best Picture, Director, Screenplay, Actor, and Actress. Not a bad turnaround. It was a feat no one could have predicted, nor could it have been planned. In 1933, M-G-M purchased the rights to the short story “Night Bus” by Samuel Hopkins Adams about a young heiress on the run from her father, who wants her to annul her hasty marriage to a man he thinks is just a “gold-digger.” Though a script was written and sent out to several actors and actresses, they all turned it down. At one point, Bette Davis expressed interest in the lead role, but her contract with Warner Brothers wouldn’t allow it. Finally, Claudia Colbert agreed to the do the film even though she had just completed two others, Cleopatra and Imitation of Life (both nominated for Best Picture that year). Colbert was a major star at the time and had already starred in twenty-one films in just seven years. She was so popular that she could choose her projects, could move from studio to studio, and could ask any price she wanted. Her asking price? $50,000 (nearly a million dollars today when adjusted for inflation). Also, she refused to work longer than four weeks. With the production costs suddenly increasing even though production hadn’t even begun, and fearing that the film would flop, M-G-M decided to let the script go–for a small price. Clark Gable began his career as an extra in thirteen films before becoming a contract player with M-G-M. Between 1930 and 1933 he starred in twenty films, seventeen for the studio and three “on loan.” At the time, M-G-M had no project for him, but was still having to pay him $2,000 a week. So, M-G-M loaned Gable to Columbia for $2,500 a week. They even threw in the script for Night Bus, though Columbia would have to pick up Colbert’s $50,000 price tag. Despite not liking the script, Gable and Colbert got along well and made the best of it, with Gable often playing practical jokes on set. The mood was light and production went fairly smoothly, leading to excellent on-screen chemistry between the two leads. The title of the film was changed by borrowing from the tag line on the book’s cover: “It happened one night that they were forced to share a room.” The film opened to mostly positive reviews but did not initially find an audience and was expected to close without a profit. Then something strange happened. Depression-era small town audiences fell in love with Gable and Colbert and their attempts to put one over on the rich guy. Having to stay in less-than-luxury accommodations, hitching rides whenever possible, and being forced to eat “uncooked carrots” straight from the garden were experiences the audience could appreciate. Through word-of-mouth, the film became a box-office smash. And on awards night, it became the first across the board winner. The film holds up today with Gable showing that he could do comedy as well as drama, Colbert giving one of three performances in Best Picture nominated films, and Capra earning the first of his three Best Director awards. It is truly an example of everything coming together at just the right moment. Don’t believe me? 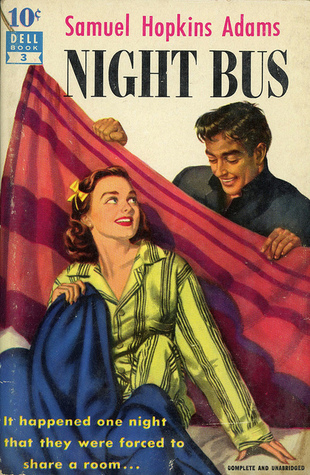 “Night Bus” was adapted four other times, including as a musical. None are even remembered. Gable returned to M-G-M and made four more films in 1934 and four in 1935. The last one in 1935 included his second Academy Award nominated performance as Fletcher Christian in the Best Picture-winning Mutiny on the Bounty. Gable shared the nomination with two of his co-stars: Charles Laughton as Captain Bligh and Franchot Tone as Ensign Roger Byam. It is the only film to garner three Best Actor nominations, which is a testament to director Frank Lloyd. Though Lloyd was nominated, he lost to John Ford for The Informer (the first of four for Ford). Bounty is tense, brutal, and thrilling. It makes use of several island locations off the coast of California and is even shot on location in French Polynesia, Tahiti, and the South Pacific. The always excellent Laughton gives a scenery-chewing performance as the maniacal Bligh and Gable holds his own against him as the level-headed Christian. We hate Bligh when he insists on lashing a man who is already dead, and we applaud Christian when he leads the mutiny. The scenes on the ship alternate between claustrophobic and sweeping and are beautifully captured by cinematographer Arthur Edeson, who was responsible for All Quiet on the Western Front and Frankenstein and would go on to shoot The Maltese Falcon and Casablanca. Edeson is one of the greatest directors of photography Hollywood has ever produced but is, unfortunately, often overlooked. Even a cursory viewing of Mutiny shows the influence he would have on later films like Master and Commander and the Pirates of the Caribbean series. The scenes on the island paradise are a welcome respite from the intense ship scenes. Director Lloyd showed that he could balance romance, action, and thrills while creating tension and an impending sense of dread, all things he failed to do with Cavalcade. Both of these pictures are deserving of their prizes and are excellent examples of why Gable was such a sought after leading man. Coming up next time, Hollywood turns to biographies.